Leadership development is essential training for engineers. In the Cockrell School of Engineering, we provide students with a variety of communication, team-building, ethics-driven and other leadership experiences. In addition to leadership programs and events offered by the Cockrell School, students can serve as mentors and peer leaders, become officers in student organizations or join groups and initiatives across campus. Through conferences and seminars, Texas Engineering students are also trained in how to serve in leadership roles, how to engage with outside organizations on behalf of their groups, why their position as leaders makes a difference in the Cockrell School and how their leadership skills will serve them well after graduation. 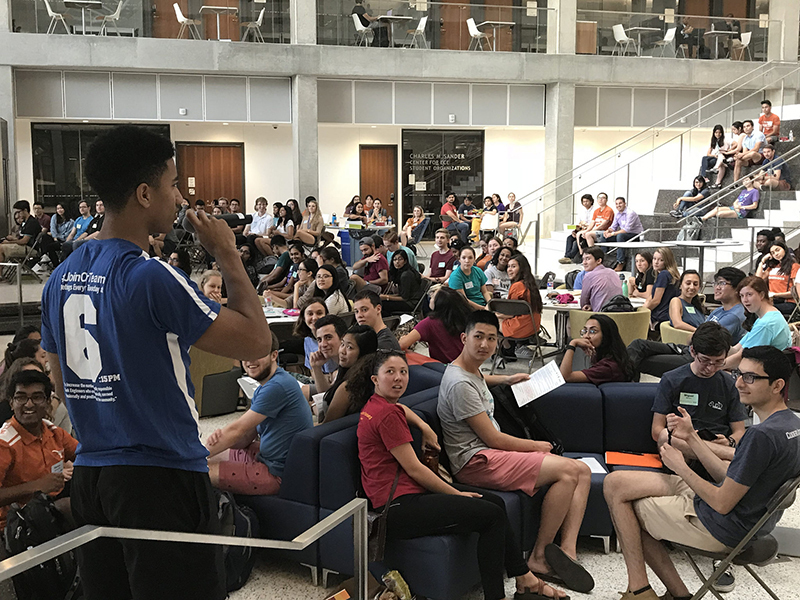 A six-day program of dialogue and self-discovery in a supportive learning community, the LeaderShape Institute is open to all UT Austin students. Ramshorn Retreats are a series of leadership development programs for engineering undergraduates. Texas Engineering Ambassadors serve as representatives of the Cockrell School by participating in a wide range of activities and initiatives, including serving as presenters, facilitators and hosts at a variety of school-wide events on campus or in the community.